1.Order your fish from a website able to ship you the stock. This is not available everywhere but you may be lucky enough to live in an area where you can order online and get fish delivered to your order. The fish chipped are generally small, the size of a finger and for this reason they are called “fingerlings”. 2.Get your fish from a local farm. If you have the chance to have a fish farm close to your place, you may be able to visit them and ask to buy some young fish for your aquaponics system. Explain your project and feel free to talk with the fish farmers, they are very interesting people and you will learn a lot from them. If they agree to sale you some fish, take this opportunity to buy a bag of fish food as well. Be prepared and go with a large esky that you will fill with water. They are not always equipped with plastic bags and pure oxygen. 3.Go fishing from local rivers and dams. if you have a damn or river next to you, you may want to go fishing and stock your pond with wild fish. This is probably the most economical option but not always easy. You may have a friend who is able to reproduce fish (Tilapia…) or is growing to many of them and will be able to supply you J. If not you may be able to find someone locally from a forum. Where to find fish for your aquaponics system: this is what we’re going to see together in this video. Hello, aquaponics growers. This is Jonathan from Melbourne Aquaponics. My aim is to help you to build and manage your own aquaponics system in your own backyard to produce fruit and vegetables, also fish that are sustainable, healthy, and tasty. And if you go to a pet shop, most of the time, you are not going to find fish that are adapted to your aquaponics system, not fish that are edible and adapted to the weather where you live. So there are different ways to find fish. The first one, if you are lucky, is basically to order them from a website, an internet website. So if you live in a big city, you most probably have an aquaculture farm that is able to ship some fish to your place. So you can simply have a look online. You put the area where you live and you type the word ‘fingerlings.’ So what are fingerlings, fish fingerlings? It’s basically the fish that are very small. So when they are small, we call them fingerings because they are the size of the finger, sometimes way smaller. So they are called fingerlings. So if you look on the internet, you put ‘fish fingerlings’ and the name of your location, and you may find some hatchery that are able to sell you some fish. So sometimes you have to go there which is great if it’s close to your place, but sometimes they are unable to ship them to where you live. So if it’s the case, that’s perfect, very easy. You order online. You transfer the money and you receive the fish. So the fish, when they arrive, they are packed in a bag, transparent plastic bag, most of the time. In this bag, the fish farm farmer, the hatchery, they’re going to put some water and on top you got a volume of air. In this air sometimes they put pure oxygen, very often, actually. It helps to maintain a very high concentration of oxygen in the bag. So depending on the number of fish that the hatchery is going to be able to pack for you, the pack is going to be able to remain, to keep the fish alive for 24-48 hours, sometimes more. So it allows them to really ship them to a nice perimeter and sometimes it reaches your place. So have a look on the internet and that’s the first spot where you can find some fish. Then you also have the possibility to go there, to go to the fish farm and to buy the fish. So have a look on the internet. If you find some fish farm around your place, they may not be able to ship some fingerlings because they may not be interested, but sometimes they may be happy to sell some small ones, some fingerlings or some yearlies, so fish that are only one year that you can take and grow in your aquaponics system. So that’s really convenient. Have a look also, if you can’t find a fish farm, have a look for a hatchery. You put ‘fish hatchery’ and look what is around your place. If you know the species of fish that you want to grow, put the name of the fish, ‘trout hatchery,’ ‘trout farm,’ and you put the location, right? That’s going to help you to localize some fish farm around your place. So if you go to the fish farm, please take some time to talk with the fish farmers. They are very interesting persons. Most of the time you can get some really good advice depending on the species you’re going to grow. You know, each species, I’ve got some specificities and also the species that they are going to grow most of the time is going to be very well adapted to the weather condition of where you live. So the person is going to give you some really good tips, you know, like “Oh, after this month, the fish is not going to eat much. It’s going to eat this quantity of food, this type of food, quality of food.” So very often, you’re going to be able to buy a bag of fish food from them as well. So it’s really perfect, you know. So try to basically create a relationship with those farmers, and sometimes if you are a beginner you may be able to call them for advice you know, and they will be very happy to give you some advice. So it’s a very good thing to do to go to the farm and spend a good time with people and be very interested in what they do, and most of the time if you are interested in what they do, they’re going to be very happy to give you some very useful advice. So the third thing is to basically go fishing in the local river or in the local dam where you live. So obviously, in aquaponics, we are growing fish in freshwater so don’t go fishing in the sea, but if you are in freshwater, if you have some lakes around your place or rivers, go there. Try to go fishing and see what you can catch. If you can catch a few fish of the same species, it may be interesting to grow them, depending on what it is. But at least you know that it’s adapted to the weather condition of where you live. Now, it doesn’t mean that it’s going to be good in the tank. So you need to do a bit of research making sure that the fish is going to be able to survive in the tank at home because in the tank, most of the time, we don’t have much current. We don’t have the same quantity of oxygen as in a river. So it’s always possible to keep them in a tank but then you will maybe have to increase the quantity of oxygen available in the fish tank to adapt it to the species of fish that you want to grow basically. But really, going fishing in the local river is interesting, and sometimes you can even recreate a whole ecosystem. You go fishing and then you can see some maybe either freshwater prawns, whatever, crayfish you know, yabbies or whatever type of animal that you can find. Sometimes it’s very interesting to grab them and to put them in your ecosystem as long as they’re not going to eat the other fish that you are already trying to grow, right? But if you can catch a few fish here and there, then after a few times going fishing that’s really nice to spend some time in the border of a river or a lake. You spend some good times there. You come back home and then you have the fish and you grow them at home. I think it’s also quite fun so that could be another thing really to go fishing and to grab the fish from the local rivers and lakes. The fourth source of fish will be your connection with other people who are growing fish in aquaponics. So you may have some friends who are already growing some fish in aquaponics and in this case, it’s perfect. You can go there. Maybe the fish are reproducing by themselves in the setup or maybe your friend has got too many fish. You know, sometimes when you stock the fish when they are small, you can put a lot of them, but then when they grow, the biomass of fish is increasing in the fish tank and then you need to sell a few. So then you can buy some from your friend and that would be perfect. You know, it would be good for him, good for you, and also your friend is going to be a good source of advice. So point number four is to basically get from them from relatives, friends, or connections that you may already have. Finally, you can also go online and look for second-hand websites where people sell second-hand things, and sometimes you can find some fish for sale, people who are reproducing them or whatever, same reason as your friends. They may have too many of them in their fish tank, and they want to sell a few. So that’s also a good area where you can find some fish. So I hope this video is going to be helpful, and I hope it’s going to help you to find your fish wherever you live on the planet. If you have any other source of fish that I may have forgotten, for some reason, please put it in the comment of the video. It’s going to be very interesting, and it’s going to be very helpful for the rest of the community. If you are new to this channel, you can subscribe to the channel and get every new video. 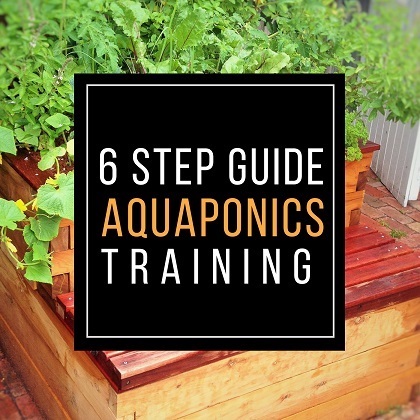 So I release one video every week, and you can also get the free training which is six steps to help you to build and manage your own aquaponics system in the best conditions. It’s going to help you to grow some sustainable, healthy, and tasty food in your backyard. So it’s really a training to help you to get the good practice and to put all the chances on your side to succeed in aquaponics. You will find this training in the description of the video just below here or in the corner you will find an ‘I’ like information on the corner of this video. You click on the ‘I’ like information, and you’re going to find the link to this free training. So once you get access to the free training, you will arrive to this page, and here you will have a detail of different steps and each time you got a video or some description to really allow you to build some strong knowledge and to know and to learn the basics of aquaponics that will avoid any mistakes. So just enter your email address and you will receive access to this training. I hope you enjoyed the video. If it’s the case, please give it a like. So if you are new to this channel, please subscribe. I’m going to release one video every week and see you in the next video. Bye-bye.